In this guide you will find all information regarding payments from online casinos. To start your adventure at this amazing place you must make a deposit. On the example of bet365 Casino I will illustrate how to transfer money and withdraw your winnings. If you do not have an account, click here, to create one and get an extra bonus of up to ?500. The first step is to log in. Then, in the login panel with a view of the account balance, go to “Deposit”. In the new window you will have to choose which deposit method you want to use. 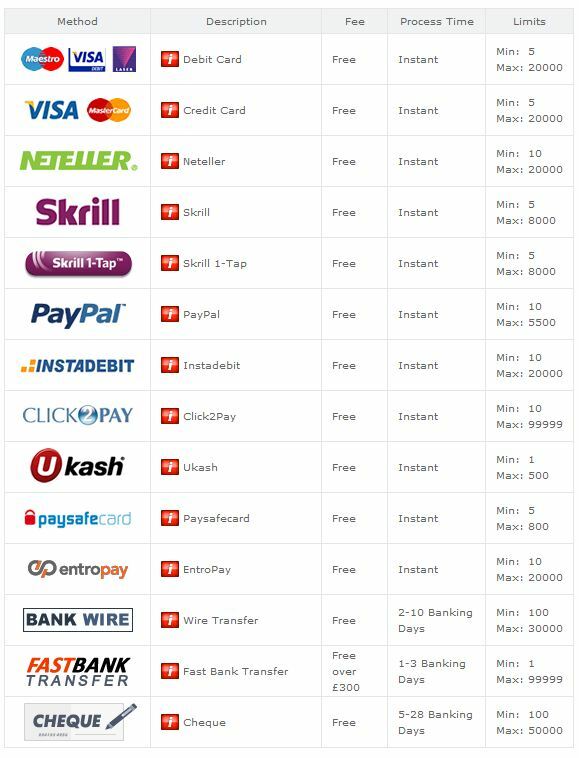 (list of commonly used payment methods and its limits below). Skrill is most supported payment method by Bet365. All Internet transfers from your bank account go through this e-wallet. Equally convenient are the prepaid cards (paysafecard, ukash) but to get them you have to visit a shop that prints that kind of codes. Another good way is a credit/debit card. Example of the deposit operation of ?5 via ?Skrill (Moneybookers)? Then you will be taken to the Skrill website. Log into your account and enter the security code, in this case it is 853371. The next window is a choice of payment method. According to the example you should use funds from Skrill account. Confirm and after a few seconds your money is at bet365 Casino. Depending on deposit method you are forced to make withdrawal with the same way. (deposit via Skrill = withdrawal via Skrill, etc., in case of using prepaid cards you will be able to withdraw your money via Wire Transfer). All payments to Skrill are free, for Wire Transfer one every 28 days is free, for more withdrawals within this period the fee is taken. To see list of withdraw methods and its limits scroll down. In the upper right corner of the bet365 Casino website press “Services”, then “Withdraw”. As I said before, to withdraw your money you must use the same method as was used to make a deposit. 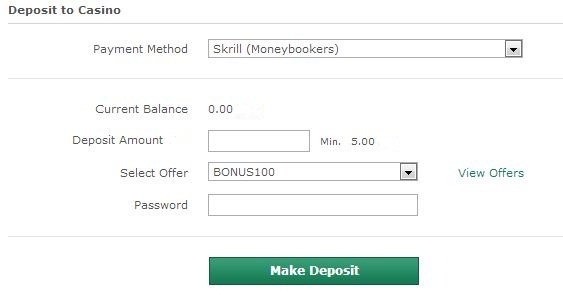 Using a further example of “Skrill (Moneybookers)” you only need to enter amount and password to the player’s account. It is said that the payment is performed within 24 hours but usually it takes only few hours. Open an account with bet365 to make a deposit and get one of three amazing bonuses!